Sounds great, right? Especially as students wander onto campuses in late-summer readiness for the new school year, the prospect of a little fun to mitigate all that looming learning must be very appealing. That’s the hope of a pair of Chicago Booth Class of 2019 MBAs who got started this year in the business of “bespoke travel for adventurous groups” by organizing the annual Booth spring break trip to Colombia for 350 of their classmates. In the early days of September 2017, as they first got involved, the trip started small. Chacin and Numa say they had no reason to think it would grow past 200 students, the size of the previous year’s excursion. But as the weeks went by, it did grow — and grow and grow. And they had only themselves to blame. “It became more developed as time went by,” Chacin says. “It was a week-long trip that included visiting three major cities, and we were expecting to have, like, 200 of our classmates given the attendance from a year before. But Moises and I got so involved and so passionate about taking people to Colombia that it got to the point where we ended up bringing 350 people. Chacin and Numa are now working to stage trips for not only Booth but Michigan Ross and the Harris School at the University of Chicago. They are “pretty far along in conversations” with a few others schools, Numa adds, including the Wharton School and Dartmouth Tuck. They haven’t taken any seed money yet, but “we would be open to that conversation,” Numa says. 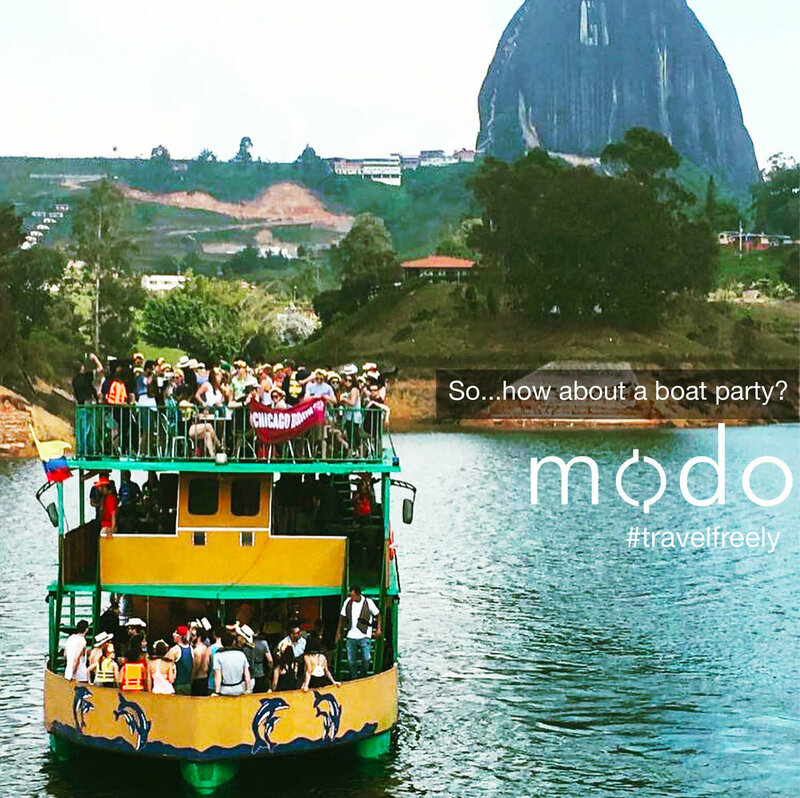 Their trips consist of a few days in major cities in Colombia or Mexico, centered on one main big-party event per city, one cultural event per city, and unique add-on activities “to round-up the experience,” according to the Modo Travel website. “Our favorite itinerary, and the one we first recommend, is getting to Bogota Friday evening and leaving Cartagena the following Saturday, so 8-9 days” at between $1,000 and $1,600 per person, Numa says. Then there’s the “floating festivals” that will be held through summer 2019, featuring “fast-paced activities, DJs, and meeting new people to the fullest,” capped by a giant multiple-school party in Mexico at the end of the 2018-2019 school year, four days of “beaches and boats” at the end of April or beginning of May. Group size can be small, 30 to 50 people, Chacin says, with an upper limit of around 350. But that’s not set in stone, they’re quick to point out. “We’re working with Michigan right now, they’ve said they want to make it as big as possible,” Numa says. “They want to take the first-years and the second-years. The way we have it set up is that it can easily be arranged to do more (than 350). If Booth says take 400 next year, then we take 400.” But size is secondary. The chief selling point of Modo Travel, Chacin says, is that the trips serve as a “value-add” for MBAs, an “end-to-end experience” unlike any schools are able to provide themselves. “As of now, when people have organized these kinds of trips they have usually done it in a very informal manner,” Chacin says. “They’ve been planned by people who don’t do the extra events and parties, who miss the things that really make up the experience, like the local experience — we show people what locals like to do, and we try to avoid taking them to big hotels. In Cartagena, they see private houses and the old city. Even Colombians, when they go there, they visit those types of places.